UPTOWN — In anticipation of 35,000 music fans flooding the lakefront in Uptown for Wednesday's Mumford & Son's concert at Montrose Beach, city workers cleared out the homeless living under nearby viaducts. An official with the city's Department of Family and Support Services said Tuesday's action was part of a larger effort to secure the area for the concert. But some homeless advocates said the move lacked coordination and led to confusion. The move at Lawrence Avenue and Marine Drive was chaotic, but there wasn't noticeable tension between the homeless and city workers. Some of the homeless people stuffed their belongings into garbage bags, exchanging hugs and shedding tears before getting into cars with Family and Support Services workers. Others talked to Salvation Army workers and Chicago police officers or dried their clothes in the grassy area near the viaduct. The area was hit by a huge storm Monday night, flooding the viaducts under Lake Shore Drive where the homeless had set up tents. Billy Bowers, who lives in one of those tents, said the city gave him some extra time to let his belongings dry after the major storm that flooded several neighborhoods. Bowers was one of many who was taken to homeless shelter Cornerstone Community Outreach, 4628 N. Clifton Ave.
"We have no choice but to move," he said. 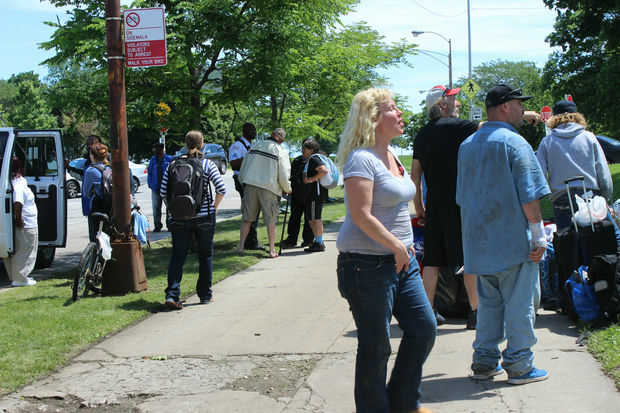 According to homeless advocate Patricia Nix-Hodes, who works as the director of the law project for organization the Chicago Coalition for the Homeless, the scene demonstrated a lack of coordination on the part of city agencies, which resulted in confusion. "Some people thought they had to leave on Tuesday. Some people were told they could stay on adjacent lawns. There seems to be so much lack of information that was consistent and communicated to everyone," she said. It's common for the city to clean the viaducts, which forces some of the homeless people living there to move their stuff temporarily to a nearby hill. But Tuesday's street-sweeping was different. They weren't allowed to relocate to a nearby hill or anywhere near the viaduct because the cleaning was part of a larger effort to secure the area ahead of the Mumford & Sons concert Wednesday evening. "It's not unlike what we'd normally do, but there's another issue tied to it. There is a concert expected to attract 35,000 people and they'll be using this viaduct [Lawrence Avenue and Marine Drive] and the one at the Wilson [Avenue] as access points. They've got to keep them clear, it's a safety issue," said Matt Smith, a spokesperson for the city's Department of Family and Support Services, who was out at the viaduct with other city workers. "We're here to make sure people here know that there is going to be an event in the area. We're here to offer shelter and services and, in some cases, transport people," he said. Smith said in addition to posting signs, DFSS officials came out to the viaducts prior to Tuesday to "make sure" the homeless people knew they'd have to leave the area. But Nix-Hodes said taking the homeless to shelters isn't enough. "If homeless people are being displaced by a concert, they should be offered housing assistance and resources and have some place safe to go," she said, adding that shelter is different than housing and many of them have tried shelters and have had "bad experiences." Nix-Hodes and her colleague, Diane O'Connell, who works as a staff attorney for the Chicago Coalition for the Homeless, said if the clearing of homeless were a measure used to secure the area before the lakefront show, the city would likely be doing other things like putting up barricades. "I've been Downtown and they start barricading the area for the Blues Fest, but that's not happening. They're just saying the homeless people have to leave," said Nix-Hodes. She added: "The concert's tomorrow night. It's not this morning. If that was the concern, why not do something closer in time to when people would be coming to the area?" O'Connell said while she understands the city has the authority to secure an area in preparation for a big event, requiring that homeless people leave the area isn't necessary. "When you tell people who are homeless that they have to get off the grass in the park, but other people are free to sit on the grass in the park ... there's no real apparent reason why it's necessary. That violates the Homeless Bill of Rights, which says homeless people have the right to freely move about public spaces," she said. O'Connell had been sitting on the grass near the viaduct since 8:40 a.m.
She and Nix-Hodes were still sitting in the grass on the nearby hill around 12:15 p.m. — at least an hour after all of the homeless people had vacated the area. That's because Nix-Hodes and O'Connell wanted to make sure a shopping cart full of someone's belongings would get picked up, stored in a safe place and eventually reunited with its owner. They were told a truck with the city's department of streets and sanitation would be coming to pick up the belongings on Tuesday morning but it hadn't arrived as of 12:30 p.m.
A spokesperson for the department said the "brief delay in the process" was due to car problems. "The process quickly resumed once the vehicle was operational," the statement reads. O'Connell said if she and Nix-Hodes weren't there, the homeless people may never have been reunited with their belongings. Nix-Hodes asked the city in advance if they could give the homeless people information about where their belongings are being stored, but the city didn't seem prepared. "As they were taking these people to the shelter, Patricia was like: 'Are you going to do that? Can I get a copy in writing?' Of course they didn't have that ready." She said while they did end up writing down addresses last minute with a Sharpie, the destination of their belongings was not clearly communicated. "It was not clear at all that they understood where the objects were going to be. It wasn't clearly communicated," Nix-Hodes said. Ald. James Cappleman (46th) whose ward includes the two viaducts, has said that the city needs to do a better job of getting the homeless off the streets, which includes better coordination among city agencies. He could not be immediately reached for comment. JAM Productions, which is putting on the show, is expecting 5,000 bikes at the concert Wednesday. The production company, which could not be immediately reached for comment regarding the homeless people being required to leave the area, is encouraging people to take public transportation or ride their bikes because there is no parking near the Cricket Hill show. When Is Spring Break For Chicago Public Schools?